Submitted materials should not be previously published. The deadline of abstract submission has been extended to 18 February 2013. Confirmation of acceptance of abstracts will be communicated to the Presenting Author by 22 February 2013. If no reply is received by the date, please contact the Secretariat. 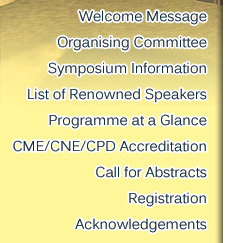 The exact schedule of shortlisted presentations at the Symposium will be communicated to the Presenting Author by 1 March 2013. All presenting authors will enjoy an exemption of registration fee once their abstracts are accepted. Note:	The deadline of submission has been extended to 18 February 2013 (postmark). Abstract sent in by fax will not be accepted. Prizes each for the oral and poster presentations will be awarded for the outstanding presentations by young researchers. Authors should indicate on the abstract form if they wish to have their abstracts considered for the Award. Shortlisted finalists will be requested to make presentations for the adjudicators to review at the Symposium.